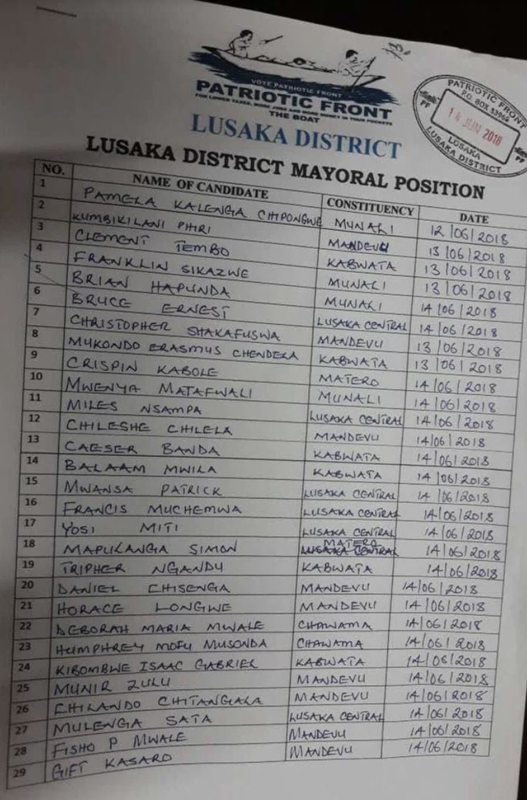 An astonishing 29 people have filed their nomination papers for adoption as the Lusaka Mayoral candidate for the PF. A list from the PF Lusaka Distrcit Secretariat showed that of the 29, former Commerce, Trade and Industry Deputy Minister and former defector Miles Sampa is leading the pack along with former President Sara’s son and fellow defector Mulenga Sata alongwith the former Lusaka Mayor FIsho Mwale. Those of us who pessimists are will question the validity of Miles Sampa and Mulenga Sata’s bid for the position. Having both made a show of leaving the PF in 2016 and siding with UPND, arguing on numerous occasions the party was not what it was under President Sata – they both returned to the fold when a position of power was up for grabs. Others are Lusaka Business man Trevor Ngandu commonly knows as Uncle T, current Deputy Mayor Chilando Chitangala and youth activist Munir Zulu and Brian Hapunda. The list also includes former Mayor Daniel Chisenga and losing 2016 Kabwata aspiring Member of Parliament Clement Tembo. Meanwhile, the Patriotic Front has issued guidelines to all Mayoral aspiring candidates and their supporters ahead of the elections.